We found out on the first day of fall, a quiet Sunday only a week after we moved into our new house. We had an idea that it might be possible, but after a few disappointments, I couldn’t really let myself believe it was actually real. I always thought I’d be the girl to buy 20 tests and take them for days before it was possible to get a real result, but I waited. And waited. And waited. I had all these cute ideas about how I’d make Dan check, because I’d be too nervous to look myself… and the + appeared before I could even set the damn thing on the counter. Within seconds. I made myself wait a whole 24 hours before I ordered the tiny red Converse. I also ordered myself a new pair of chucks, partly because I needed a new pair of black ones, but partly so I could assemble my method of telling people. 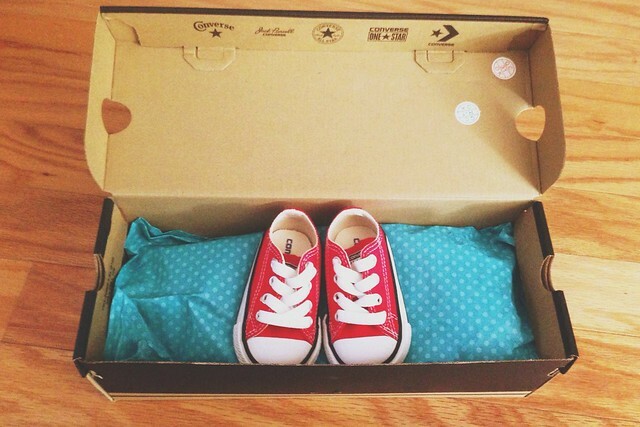 I nestled the tiny sneakers into the adult-sized shoebox, with a book and a few other random things to weigh it down and make it feel like it had big-sized sneakers inside. A week later, a few hours into a birthday dinner for my sister, I told my family that I had bought a really crazy pair of Converse – maybe the wackiest pair yet – and I brought them for show and tell. I passed the box to my mom first, who opened it, looked at me in utter disbelief, closed the box, and handed it back. Then I handed it to my dad on my right side, who opened it, gave me such a Look, and handed it back. Meanwhile, my brother-in-law is all, “Well FINE. We didn’t want to see your new sneakers ANYWAY.” and I’m wondering how everyone is being so quiet as I try not to shake. Finally, I opened the box so my siblings and their significant others could see, and my sister screamed and jumped out of her seat, and chaos ensued. It was pretty amazing. And the best part? They all honestly believed that it was just that I’d bought a pair of neon glitter-striped Converse and was so excited to show them. We told Dan’s family in a more traditional way (well, by him pointing in triumph at my belly and waiting for them to catch on) but the reaction was equally chaotic. Waiting all this time to tell The World was really, really hard. So I haven’t really been writing here, partly because of how tired I’ve been (which, yes, has been due to my moving hangover, and getting used to my new commute, but also because of my…condition), and partly because it’s really hard to say anything at all when you can’t talk about the ONLY THING you can think about, ever. It’s strange how the first trimester messes with your brain! but exciting that you can share now. Congratulations! What a fun way to tell your family. Those tiny shoes are just so adorable! Oh haha, I meant for you/your own shoes! I never tied my own after 5 months pregnant! I keep coming back to this post, and I love it every single time. I am so happy for you two!